The new iPad, which went on sale last Friday, appears to be 5 C hotter than its predecessor when running, according to Dutch technology website Tweakers. One disgruntled customer said he was returning his after it reached temperatures of 47 C (117 F) following only ten minutes of use. 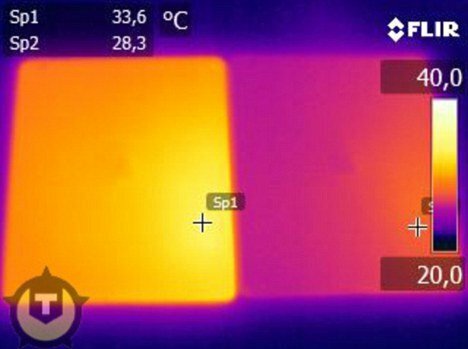 Customers have complained that the gadget is “too hot to hold”, particularly when playing games, prompting a spokesman for the U.S. watchdog Consumer Reports to announce it was conducting its own “scientific analysis with thermal imaging”. Consumer Reports found that the product became “significantly hotter” after playing the popular game Infinity Blade II, with temperatures of 47 C recorded on the device’s front and back. However, tester Donna Tapellini said the gadget was “not especially uncomfortable if held for a brief period”. One user of Apple’s official support website said: “I think we all know what we have to do – which is to return the iPad. “They simply did not do a good enough job with this iPad, maybe next year. They also have so much money now that they are giving it away to the stock holders. A spokesman for Apple said the new iPad’s performance was “well within our thermal specifications”, adding that concerned customers should contact the company. The launch of the iPhone 4 in 2010 was also troubled, with buyers complaining that the handset could not connect to the internet or make calls if held in a certain way. Tweakers said: “On the left is the new iPad – with a temperature of 33.6 C in the lower right hand corner. The Dutch bloggers say that their image tallies with complaints on Apple websites. “Forum messages noted that the location of the processor is a hot spot,” says Tweakers. On blogs, some iPad owners have even claimed that it goes into “cool down mode” and freezes until it has reached a stable temperature. The issue seems to be confined to the bottom left hand side, though some people said that the whole left side of the device was too hot. In a separate threat on the Apple website user znz212 wrote: “It begins getting warm within about 10 minutes for me, and after about 25 it’s quite hot to touch (not hot enough to burn or anything, but hotter than it feels like it should be). “I can even feel the heat on the front – the top half of the screen is warmer than the bottom half. Apple has not addressed the problem directly but customers who took their iPad to a store have written that it has been exchanged for a new one with no problems. This is not the first time that Apple has run into teething problems with its gadgets. The launch of the iPhone 4 was marred by reports that it would not connect to the Internet if it was held in a certain way. Apple solved the “grip of death” issue by giving out a free silicone rubber band to put round the phone. Among the other glitches have a software problem with iPhones and iPod touches which stopped the alarm clocks working until Apple issued an update to sort it out. The iPad went on sale on March 16 and was widely praised for its 3.1 million pixel 9.7″ Retina display, which is the sharpest out of any tablet computer. On the official Apple website it says the iPad should stay below 35 C for optimum “operating temperature”.